SCVHistory.com LW3043 | Native Cultures | Two Indians Huddle for Warmth, Inyo County, 1930s. "Inyo Desert — Two Indians huddle around a campfire to escape cold wind." The original 4x5-inch negative went to the Getty. This is an early 4x5-inch copy negative from the Watson Archive. 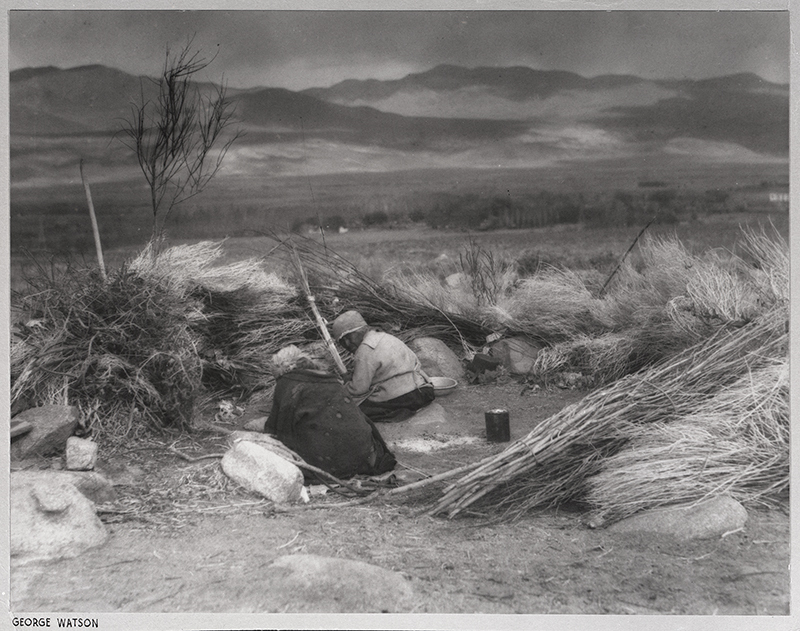 Basketry might provide a locational clue within Inyo County, but we're not seeing basketry in this photograph. Instead the people are using a Western bowl, frying pan and some sort of metal canister. They are wearing Western clothing (including hat). They have traditional grinding stones (far left) and a brush windbreak, but there are no cultural materials that would tell us whether they're Newe (Shoshone) from Death Valley or Nüümü (Paiutes) from Owens Valley or Saline Valley or Round Valley/Bishop. The mountains, likely the easternmost Sierra Nevadas, would suggest Owens Valley or perhaps the more southerly Coso Range. The view is likely to the west. If it's Owens Valley, it might explain the news rationale for this photograph. In the 1930s, the City of Los Angeles was still pursuing its goal of "removing" the last native inhabitants of the land it purchased for its Los Angeles Aqueduct. It sought to convince people to move to the tiny reservation that had been established in 1915 at Fort Independence, just north of the town of Independence. The partial removal of the Indians from the Payahüünadü — the place of flowing water (Owens Valley) — cleared the way for American farmers and ranchers to prove up homesteads there. The native inhabitants were allowed — by law, and usually in practice — to live on the land. Many of the men who survived the new American diseases found employment as ranch hands. So, when Los Angeles city officials started buying up land and water rights from Owens Valley farmers in the first decade of the 20th Century, many Paiutes were still living there and using the water. Perhaps the people in this photograph are two of the last native people living on L.A. City property in Inyo County. We don't know. Today, in the 21st Century, the Bishop Paiute Tribe, whose members include descendants of the first residents of the Owens Valley, continues to deal with the City of Los Angeles in pursuit of habitat restoration, access to ancestral lands and sacred sites, and use of the water that had sustained the people for thousands of years. LW3043: 9600 dpi jpeg from 4x5 negative purchased 2017 by Leon Worden.